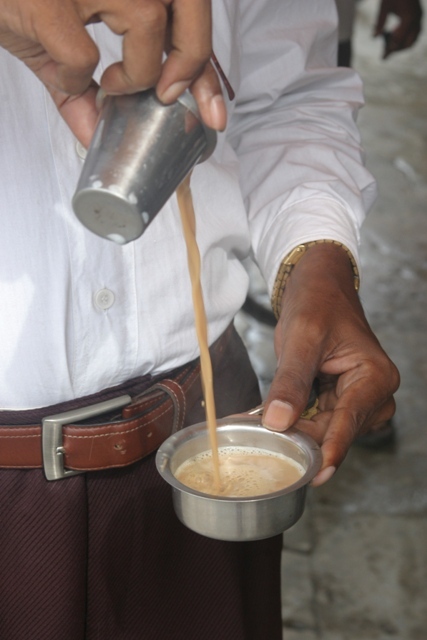 South Indian filter coffee is rapidly disappearing, replaced by instant coffee powder. But whether or not these street-side coffee bars use filter or instant coffee, the “mixing” of boiled milk and coffee is still done the same way. The coffee is generally served in a steel cup with a lip and a small, empty bowl (also with a lip) so that the customer can perform a mini version of the same process – pouring the coffee from the cup into the bowl, and vice verse, holding on to the edge of the lips of the vessels (the liquid is boiling hot!) – but this time, to cool the coffee enough to drink. And the taste? Like coffee candy.